Joshna Maharaj, left, and Peter Sloly are the inaugural winners of McMaster's Greater Toronto Area Community Impact Awards. The pair were celebrated this week at a luncheon in Toronto. McMaster celebrated Toronto-based alumni Oct. 1 at the first Greater Toronto Area Community Impact Award luncheon. Joshna Maharaj ’00 and Peter Sloly ’89 were presented with the award at the Berkeley Fieldhouse in front of friends, family and the community. The award recognizes individuals who have made a positive impact on the GTA community while reflecting McMaster’s values of integrity, quality and teamwork. Maharaj is a Toronto-based chef, a good food champion and an institutional food reformer. She is currently the assistant director of food services and executive chef for Ryerson University, where she is leading a transformation of campus food services. She believes that universities can nurture a more sustainable food system with thoughtful food procurement, consumption and advocacy. During his time at McMaster, Sloly played professional soccer and was a member of the Canadian Men’s National Soccer Team. 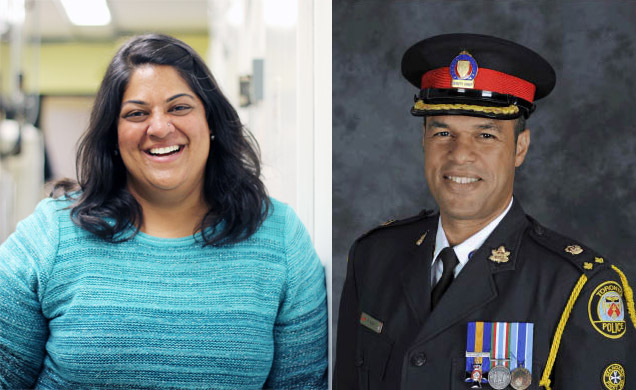 He is now the deputy chief of the Toronto Police Service where he is responsible for Community Safety Command with its 4,000 police officers, 200 civilian members and $451 million budget. Sloly has served on the boards of directors of many organizations including Spirit of the People, Covenant House and Red Cross Canada, among others. The luncheon also celebrated the student recipients of the Community Contribution Awards, which recognizes the contributions that current students make to the University and the community. McMaster celebrated Toronto-based alumni Oct. 1 at the first Greater Toronto Area Community Impact Award luncheon. Joshna Maharaj ’00 and Peter Sloly ’89 were presented with the award at the Berkeley Fieldhouse in front of friends, family and the community. The award recognizes individuals who have made a positive impact on the GTA community while reflecting McMaster’s values of integrity, quality and teamwork. Maharaj is a Toronto-based chef, a good food champion and an institutional food reformer. She is currently the assistant director of food services and executive chef for Ryerson University, where she is leading a transformation of campus food services. She believes that universities can nurture a more sustainable food system with thoughtful food procurement, consumption and advocacy. During his time at McMaster, Sloly played professional soccer and was a member of the Canadian Men’s National Soccer Team. He is now the deputy chief of the Toronto Police Service where he is responsible for Community Safety Command with its 4,000 police officers, 200 civilian members and $451 million budget. Sloly has served on the boards of directors of many organizations including Spirit of the People, Covenant House and Red Cross Canada, among others. The luncheon also celebrated the student recipients of the Community Contribution Awards, which recognizes the contributions that current students make to the University and the community.